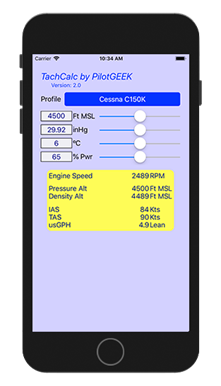 Save fuel and money by leaning your fixed prop engine at cruise – regardless of altitude – easily with PilotGEEK's TachCalc. Aircraft POH's recommend leaning above 5000 feet to protect the engine from damage. 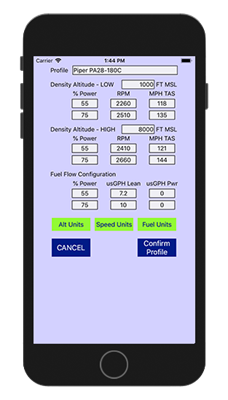 TachCalc lets you quickly and easily calculate your target RPM for the power setting desired for your current altitude. 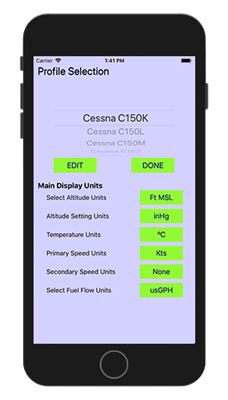 And TachCalc simplifies your fixed prop flight planning by allowing you to determine both the best power setting for cruise at your selected altitude and the TAS to file. TachCalc allows you to modify an existing profile to match your POH or create a new profile from scratch. TachCalc uses linear interpolation of the POH data to determine the RPM and TAS. 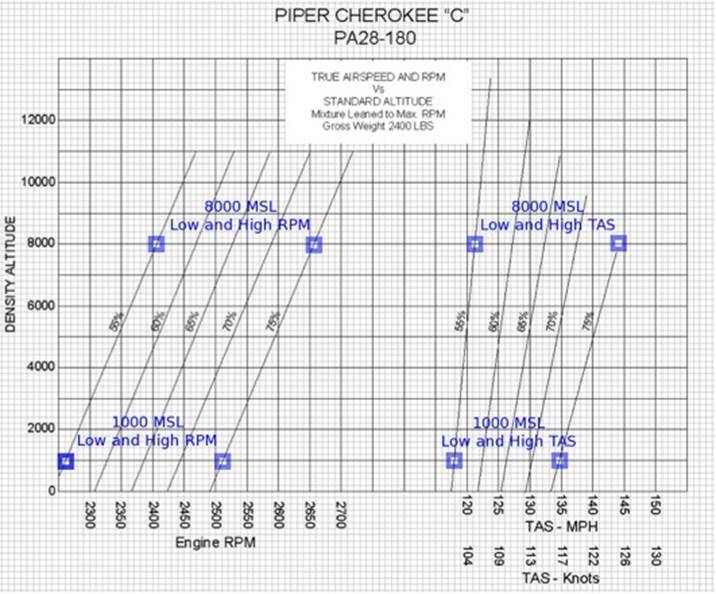 The following procedure is for Piper that uses charts to specify performance. The majority of the other POH that I’ve reviewed use tables that allow direct entry. Just make sure you chose the standard temperature column. That way the altitudes are Density Altitudes that are corrected for Temperature. 1. Select a profile that is closest to the plane you wish to edit or to use for a new profile and tap the EDIT button. 2. Update the Profile name for a new profile, or just leave it alone for updating an existing profile. If a new profile name is entered, the original profile will still be selectable from the profile page. 3. Select the Alt Units, Speed Units and Fuel Units to match the units displayed in the POH. Note in the example shown in the chart below, the PA28-180C has true airspeed specified in MPH and altimeter units in Feet MSL. A different chart has the Fuel Flow specified in usGPH. 4. From the aircraft POH, determine the RPM and TAS for a high and low percent power for the same density altitude and enter into the appropriate fields. You’ll note that on the chart below, 1000 Feet was chosen where the 55% power line crosses 1000 Feet at 2260 RPM and 118 MPH TAS. 6. Click “Confirm Profile” to save or “CANCEL” to cancel the edit.